Three Sims Metal Management directors have topped up their holdings. Chairman Paul Varello has acquired another 7,400 shares for US$113,516, an average price of US$15.34, he now holds 82,325 American Depositary Shares. James Thompson acquired another 7,000 American Depositary Shares for US$107,140, an average price of US$15.30. He now holds 12,000 American Depositary Shares. Dart Energy has commenced drilling at its Dajing project in Xinjiang Province, China, spudding the first two exploration wells. The initial exploration program will see up to 14 exploration wells drilled before year end, and assuming no delays Dart expects the first core drilling results to be available in the first quarter of 2012. Executive chairman, Nick Davies, said "We are now operationally underway at Dajing, which is a major milestone for Dart. Dajing has the potential to be a project of substantial scale within the Dart global portfolio, and our attention is completely focussed on executing the exploration drilling campaign diligently, quickly and safely. Transpacific director Raymond Smith has indirectly acquired 40,000 shares at 77.25 cents each, a total value of $30,900. Galaxy Resources has signed off-take framework agreements with 13 Chinese ebike manufacturers for all of its battery production from its proposed Lithium-Ion Battery Project in China's Jiangsu province. Managing director, Iggy Tan, said the level of interest in the batteries from major ebike producers underpins the company's plans to add a highly-automated battery manufacturing plant to its downstream portfolio. "The completion and commencement of the Jiangsu Lithium Carbonate Plant is our first priority, nonetheless, these off-take framework agreements are important preparatory work for our proposed pipeline Battery Project," he said. The five year framework agreements include a minimum purchase condition of between 15,000 and 40,000 battery packs per annum. Battery prices will be set on a quarterly basis and subject to market price adjustments. Production is expected to reach 350,000 lithium-ion battery packs per annum, but can be tripled in capacity subject to demand. "The off-take agreements are subject to the Galaxy Board's final investment approval for the Battery Project and [the board] will not consider making this decision until the Jiangsu Lithium Carbonate plant is completed," said Mr Tan. "The Chinese ebike manufacturers we have signed agreements with were particularly interested in the proposed plant's technological capabilities, as well as the quality and density of the batteries we would produce," he said. "China currently produces 27 million ebikes per annum and is gradually replacing the bikes' heavy lead acid batteries with lighter lithium-ion battery technology. The majority of ebikes manufactured for western markets - the Americas and Europe in particular - have lithium-ion batteries." The Battery Plant will also produce cylindrical cells able to be used in a wide range of batteries, including electric vehicle batteries. China's Ministry of Public Security recently announced that ebikes made in China with a maximum speed of 20 km/hr should have a maximum weight of 40 kilograms. Galaxy forecasts a transition away from heavy lead acid batteries towards lighter lithium ion batteries in order to meet this regulation. Infigen Energy has appointed Ross Rolfe AO as a director. Mr Rolfe has broad experience in the energy and infrastructure industries in senior management, government and strategic roles. 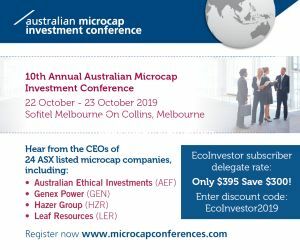 Until recently, he was chief executive officer and managing director of Alinta Energy, which had interests in 10 power stations and 600,000 retail gas and electricity customers in Victoria and Western Australia. Prior to 2007, he held a number of chief executive positions in the Queensland public service, including the positions of Director General of the Department of Premier and Cabinet and Co-ordinator General. Mr Rolfe was also the chief executive of Stanwell Corporation, one of Queensland's largest energy generation companies, between 20012005. CMA Corporation's shares have made a long awaited and generally encouraging return to trading, which is currently on a post-consolidation and deferred settlement basis. On 6 September the shares hit a low of 29 cents but have since trended upwards to a high of 39 cents. When the shares were suspended in February 2010 they were trading at 8 cents. The company's 40 to 1 share consolidation means that these original shares are worth one fortieth of the current share price or about 1 cent. That is a huge loss of capital. However, shareholders were able to recapitalize the company, receiving 8 shares for their original one at 1 cent per share. If shareholders took up their entitlement, these new shares need to trade at 40 cents to maintain their value, and they are now more or less doing that. Stemcor Holdings now owns 14.9 per cent of CMA. Paul Whitehead, a director of Stemcor Holdings, has joined the CMA board. Stemcor is one of the world's largest independent steel trading groups and participated in the capital raising. It has also provided an indicative term sheet to provide a US$30 million three year revolving prepayment arrangement secured against the group's inventory and receivables. This will enable the finance of increased activity and volumes and securing an enhanced customer relationship with Stemcor. Mr Whitehead has been director of London-based Stemcor's Australasian operations since 1998 and became a director of Stemcor Holdings Limited in 2006. Paul Mann has been appointed CMA's chief operating officer and will focus on rebuilding the operational side of the business, particularly in the international divisions. Mr Mann has been in the scrap metal business for 20 years and has held various senior roles in CMA since joining in 2007. Peter Lancken will remain interim chief executive until a successor is decided upon. Mr Lancken indirectly acquired 10 million shares on a pre-consolidation basis worth $100,000. Post consolidation the number of shares is 250.000. The acquisition was part of being a sub-underwriter to the 8 for 1 entitlement offer. Arrowhead Business and Investment Decisions has issued an updated Due Diligence and Valuation Report on Algae.Tec, giving its shares a fair value range of $1.51 to $2.15. Although Arrowhead received a fee for its preparation, the 28 page report also gives a comprehensive run down on Algae.Tec, its technology, and the basis of its valuation. AnaeCo has formed a 50-50 joint venture company with Singapore-based Sindicatum Sustainable Resources to deploy AnaeCo's DiCOM waste to energy system in Asia. The joint venture will market the DiCOM system in four regions - India, China, South-East Asia and North-East Asia. It will target local development partners such as waste management companies, government entities and infrastructure developers. AnaeCo will contribute its technology and provide technical and marketing support. It will grant the joint venture four exclusive licences, one for each region, for an initial period of 24 months, which will be extended if the joint venture secures projects. Sindicatum will utilize its project development and financing capability across Asia. AnaeCo's chief executive, Patrick Kedemos, said "It is well known that the waste market is huge, and with the economic development and rapid urbanization of Asia, the opportunities for innovative clean technologies are massive. "However, despite being on the doorstep of Asia, it remains difficult to penetrate such a large and active market. Therefore we have chosen to establish strategic relationships, such as this JV with Sindicatum, to create the pathway to market. "We believe Sindicatum presents the right fit for AnaeCo at this stage of our development and we believe their project development capabilities and track record will open the market for DiCOM in Asia." Sindicatum chairman, Colin Goodall said "Recovery of sustainable resources from waste is being encouraged by the public, policy makers and regulators who will no longer accept low management standards and environmental issues caused by disposing of waste without regard to its inherent value. "Greater sophistication in municipal solid waste treatment is now required to meet clients' expectations and green targets across the region. AnaeCo provides a compelling and competitive solution in this regard." Independent engineering firm, Frazer-Nash, has verified the good results of Carnegie Wave Energy's recently tested CETO 3 device, said Carnegie's technology development manager, Jonathan Fievez. Frazer-Nash is one of the UK's largest providers of systems and engineering technology and specializes in independent advice to the defence, nuclear, energy, civil aerospace, rail, marine, petrochemical and industrial sectors, he said. Frazer-Nash has verified that the CETO 3 unit has a peak rated hydraulic power capacity of 203 kW, with an expected tolerance range of +25 per cent and -40 per cent. This corresponds with the peak power output that the CETO 3 unit would deliver in an ocean environment such as the south west of Australia. For an Atlantic wave environment, such as the west coast of Ireland, Frazer-Nash has also confirmed a peak rated capacity of 182 kW in the same tolerance range. Carnegie's managing director Dr Michael Ottaviano said "This is our first commercial scale unit and we still have significant opportunities to optimize the CETO system at commercial scale. This gives us enormous confidence as we look forward to projects and to subsequent technology generations." Frazer-Nash also verified that the peak measured capacity during the inocean CETO 3 test campaign was 78 kW, and sustained pressures of 77 bar were delivered, which is more than is required for sea water reverse osmosis desalination. The hydrodynamic and hydraulic models that underpin the CETO 3 design were also verified, giving Carnegie the confidence to continue with the design of the first grid-connected CETO commercial demonstration project. Eden Energy says its US based subsidiary, Hythane Company LLC, has commenced production of carbon nanotubes in the smaller of its first two newly fabricated commercial scale reactors. For the first trial, a very limited quantity of catalyst was used in the recently scaled up unit, and good performance and highly encouraging production levels were achieved, it said. The scale of production over the next two to three months will be increased to determine the unit's maximum production capacity. The second, larger reactor is being readied for similar trials to determine the most efficient sized unit for future commercial production. The units are modular and several reactors will be integrated to produce large-scale production models. Greenearth Energy has established a new subsidiary, Greenearth Biomass Energy Pty Ltd, and has received planning approval for its ZenithSolar Z20 High Concentration Photovoltaic (HCPV)/ Combined Heat and Power (CHP) solar technology demonstration site at Port Melbourne. Greenearth Energy said Greenearth Biomass Energy is its response what it sees as a substantial market, with governments worldwide spending billions of dollars disposing of solid waste that contains valuable unused energy and paying costs associated with waste collection, limited landfill sites, the environmental impacts of landfilling and difficulties with incineration. Greenearth Biomass Energy will over the next six months assess what it says is a unique biomass waste-to-energy gasification technology and market opportunity. The project will initially focus on Indonesia, but the technology has the potential for universal application. Managing director Mark Miller said "With the challenges Governments and communities face in dealing with waste and the need to deliver economically attractive renewable energy solutions, we see a potential opportunity for our shareholders in this new growth category. "Gasification has the ability to convert municipal and other wastes into electric power or other valuable products such as fertilizers and Syngas. Gasifying biomass and other waste streams generates positive economic and environmental outcomes for Governments, participating communities and investors alike. "Greenearth Biomass Energy perfectly complements our suite of aligned renewable and energy efficiency technologies." Meanwhile, another subsidiary, Greenearth Solar Energy, can now proceed to develop its planned combined photovoltaic and heat and power demonstration site with partner ZenithSolar. The site will allow potential investors, project developers and off take customers easy access to the technology. Eight Z20 units on the site will produce a peak output of 88 kW thermal energy (hot water) and 36 kW of electrical energy. A successful trial will result in Greenearth Solar Energy and ZenithSolar establishing an exclusive distribution agreement for the technology in Australia, New Zealand, Indonesia and a number of Pacific Island nations. A ZenithSolar Z20 CHP Solar Technology installation has successfully operated at Kibbutz Yavne in Israel since April 2009. KUTh Energy directors participated in the company's recent rights issue. Patrick O'Brien, a retired senior US Department of Agriculture Director and Presidential Commission economist, has joined Mission New Energy's Advisory Board. "Patrick's three decades of leadership in agribusiness and his commitment to slowing climate change and developing plant based biofuel, provides Mission NewEnergy with another strong voice for reliance upon responsible products for our future," said Mission's Advisory Board chairman, Major General Wilbert D. Pearson (USAF-Ret). Orocobre's 85 per cent subsidiary, South American Salars SA, has received authorization to drill exploratory wells on its Salar de Cauchari property immediately south of the Salar de Olaroz in northwestern Argentina's Jujuy province. In accordance with the project's Environment Impact Assessment, the provincial director of Mines and Energy Resources has approved a limited program that permits drilling and the construction of access roads. The program will delineate the brine body at the Cauchari Project and allow an estimation of the resource. The drill program will test the area on the company's leases directly to the south-east of the highest grade part of the brine body drill tested by Lithium Americas Corp. on its Cauchari lithium project. Orocobre said that as it announced on 31 January this year, the geological and geophysical survey information at the Cauchari Project combined information from Lithium Americas Corp. suggests there is the potential for the highest grade part of the brine body delineated by Lithium Americas Corp to extend onto South American Salar's Cauchari properties. If the brine body extends into Orocobre's properties, the Cauchari brines could be developed and processed at its planned Olaroz Project facilities for relatively small incremental capital cost. This would require an expansion of the Olaroz processing facility's capacity beyond the planned production rate of 16,400 tonnes annually of battery grade lithium carbonate. Due to the similar brine type, the potential processing route would be expected to be the same as the process developed for Olaroz, where the company has been producing battery grade lithium carbonate at its pilot plant for over six months. The Federal Government has agreed to fast-track $1.2 million in grant monies to progress development of Petratherm's Paralana geothermal energy project in South Australia. The money will be spent to assist Petratherm and joint venture partners Beach Energy and TRUenergy to accelerate preparatory work for the drilling of the second producer well, Paralana 3, which is expected to "close the loop" to enable commercial production of geothermal power to begin. The fast-tracked instalment was originally planned to be allocated after the spud-in of Paralana 3 early next year. Managing director Terry Kallis, said the funding "helps keep us firmly on track to produce Australia's first commercial supply of geothermal energy by the end of next year". Po Valley Energy announced its maiden half year net profit of 367,010 ($0.5 million) for the period to 30 June. The result was due to increased production and revenue, with first-half revenue increasing 68 per cent from a year earlier. "We made strong progress in the first half," said chief executive officer, Giovanni Catalano. "Our exploration and development programs are also progressing. We start drilling our Vitalba-1dirA well in coming weeks and, if successful, we plan to restart production from the Castello before year-end to further boost revenue growth and cash flow in 2012." "We look forward with confidence to a promising second half of the year and a good performance overall in 2011," he said. RedFlow has delivered its first systems for Asian trials, with ST Dynamics of Singapore taking delivery of the three trial electricity storage units it has purchased. The units are based on RedFlow's zinc-bromine battery modules. RedFlow engineers will work with their ST Dynamics counterparts to commission the units as lead in systems for future customer trials. ST Dynamics is a subsidiary of engineering group, Singapore Technologies Engineering Ltd (ST Engineering). RedFlow signed a Teaming Agreement with ST Engineering in September 2010. President of ST Dynamics, Mr Fong Saik Hay, said "These first systems allow us to gain experience with the RedFlow products and to apply the technology into our markets across the Asian region. Style has been able to have its previously announced non-renounceable rights issue fully underwritten. The issue will raise up to $2.1 million. Peregrine Corporate Ltd has agreed to fully underwrite the rights issue on the same terms as previously announced. In addition Style has entered into a further secured loan facility of $100,000, increasing the total loan funding to $1.2 million. The additional facility is on the same terms as previously announced and the lender will also sub underwrite $200,000 of the rights issue. To the extent there is a shortfall and acceptances under the rights issue, the loan will be partly or fully satisfied by offsetting an equivalent amount of the sub-underwriting commitments of the lender, said Style. WAG takeover target Pacific Pyrolysis Pty Ltd has received a conditional offer of $4.5 million under the Sustainable Energy Pilot Demonstration Program. The funding is for PacPyro's Carbon Negative Electricity Project that will establish a 2 tonne per hour organic waste to electricity and biochar facility in Melbourne. The Project is a key step in the commercial scale deployment of the PacPyro technology into the target markets of renewable energy, waste management, soil amendment (biochar) and carbon reduction. There are significant roll-out opportunities for the technology in Victoria and in other domestic and offshore markets, and the pilot Project will provide a critical commercialization platform to access these opportunities, said the company. The Victorian Government's support is subject to PacPyro executing a standard Funding Agreement and providing matching funding within six months of accepting the offer.